Although the Asha 311 is the flagship of sorts of the Nokia dumbphone family, its retail package is identical to that of its siblings. There's the usual pair of headphones, a short USB cable and a charger. A 2GB microSD card comes pre-inserted in the phone to complete a pretty decent package for the price. Standing at 106 x 52 x 12.9 mm, the Asha 311 is just a tad smaller than the Asha 305, but the difference is hard to spot unless you have the two side by side. They might not be the slimmest smartphones out there, but they are still compact enough for comfortable single-handed use. The weight of just 95 g is another nice part of the Asha 311 experience - you can almost forget the phone is in your pocket. 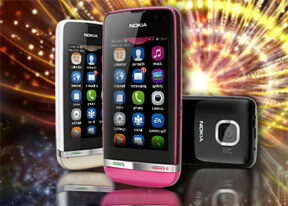 The Nokia Asha 311 is an easily recognized as part of the family. Designed with the same characteristic curves, the Asha 311 looks isn't vastly different from its siblings, never mind the changed button layout. Sadly however, that is not the greatest compliment to pay to a phone. We're not impressed with the glossy finish, which this time is applied to almost the entire back panel, and looks cheapish. Although the general build quality is pretty decent (even more so considering the price range), the Asha 311 isn't much of a looker. A large part of that is attributed to the amount of unused space around the 3" display. We're used to seeing high-end handsets use the available space better, so when you look at a handset like the Nokia Asha 311, you can instantly tell it's not part of the elite. Above the display there's an earpiece and a brand logo. The proximity sensor is to be seen up there as well as the ambient light sensor. Underneath the screen you'll find the mouthpiece, which is right below the thin strip of plastic that accommodates the Call keys. The End key will exit any currently running app and take you back to the homescreen. It's a power button too. On the right side of the Nokia Asha 311 you get the volume rocker and the lock button. Their press is not the best we have seen, but they don't really raise any usability issues. The microUSB port is placed at the top of the device alongside a 3.5 mm audio jack and the Nokia proprietary charging port. The Asha 311 comes with one of those old-school Nokia chargers but can be charged off USB too. The left side and the bottom of the Nokia Asha 311 are completely bereft of controls, the lanyard eyelet the only thing of interest there. The back panel of the Nokia Asha 311 is where the 3.2MP camera lens is located. There's no LED flash alongside it to assist its low-light performance, just the resolution label and the Nokia logo. The loudspeaker is also at the back, below the shiny strip that separates the glossy black battery cover and the matte gray bit at the bottom. We'd rather have that matte finish used on the entire body, but the Nokia designers decided otherwise. The Asha 311 is powered by a 1110 mAh Li-Ion battery, which is rated at up to 696 h of 2G stand-by or up to 768 h of 3G idling. Talk time stands at 14h (2G) and 6h (3G), but even if you use 3G connectivity (the Asha 311 boasts some impressive download speeds), you should be looking at a couple of days at least on a single charge. The memory slot and the SIM compartment are underneath the battery, so no hot-swap for the complimentary 2GB card.